A teacher of Kpotame District Assembly (D/A) Primary in the Ada East District of the Greater Accra Region, has been crashed to death by a police vehicle at Aphamaga, a suburb of Kasseh along the Tema-Aflao Highway. 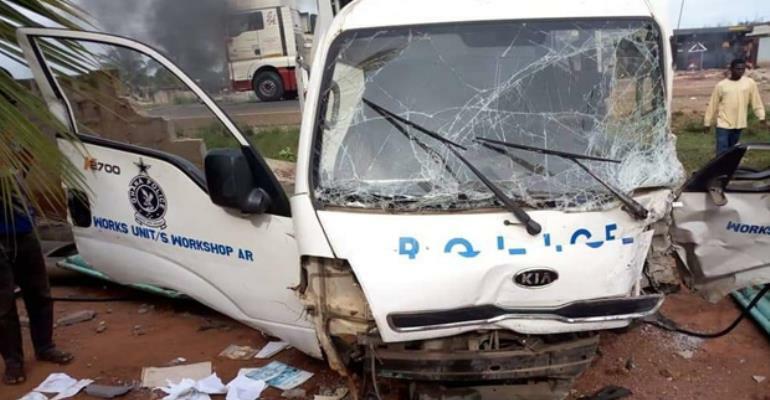 The white police Kia truck with registration number GP 3283 assigned to the workshop Department of the Ashanti Regional branch of the Ghana Police Service, was said to be over-speeding when it rammed into the motorcycle of the teacher. Identified as Vincent Kodjo Kudiabor, the deceased was returning home from school at about 3:30pm when the unfortunate incident occurred. The body has been deposited at the Ada East District Hospital morgue for preservation and autopsy. Driver of the police vehicle is said to be responding to treatment at the same health facility. According to an eyewitness, the police driver sustained injuries on his legs but the teacher died on the spot. Pieces of the mutilated body of the teacher were seen scattered around the scene after the accident but police personnel arrived soon to convey them away in a polythene bag. Police in the area said they are investigating the matter to unravel the circumstance under which the incident occurred.